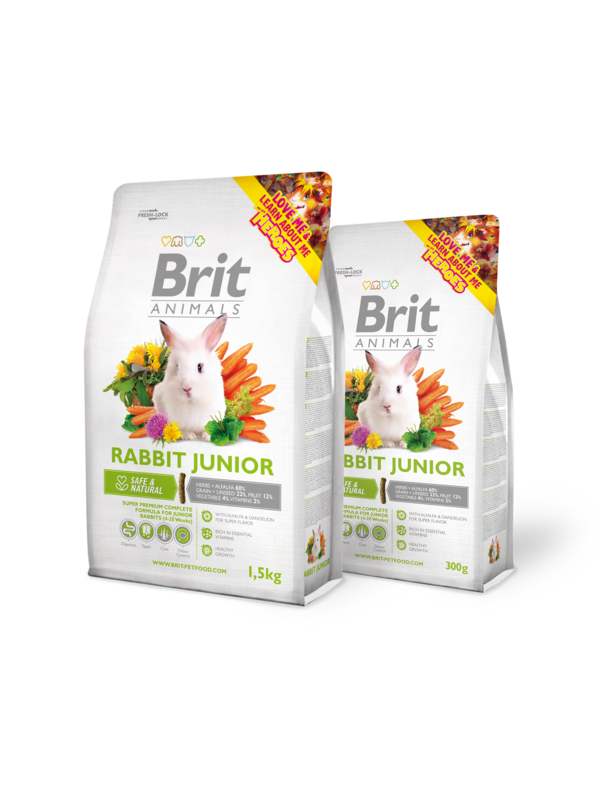 super premium complete food for young rabbits (4 - 20 weeks of age). Higher protein 16 % and fats 3 % for healthy growth. Higher in linseeds 2 % - natural source of omega-3 unsaturated fatty acids for shiny coat and neural system support. Complete in vitamins & nutrients for proper development. alfalfa, herbs (nettle, dandelion, plantain), barley, dried apples, corn, wheat, carrot, linseed, brewer´s yeast, mannan-oligosaccharides (75 mg/kg), fructo-oligosaccharides (50 mg/kg), milk thistle (50 mg/kg), Yucca schidigera extract (45 mg/kg). crude protein 16,0 %, crude fat 3,0 %, crude fiber 20,0 %, crude ash 8,5 %, moisture 10,0 %, calcium 0,7 %, phosphorus 0,4 %, sodium 0,06 %. vitamin A10 200 I.U., vitamin D3 1 250 I.U. ,vitamin E (α-tocopherol) 70 mg, vitamin C 80 mg, vitamin K 0,1 mg, vitamin B1 1 mg, vitamin B2 2 mg, vitamin B3 6 mg, vitamin B5 3,5 mg, vitamin B6 1 mg, vitamin B9 0,12 mg, vitamin B12 0,02 mg, biotin 1 mg, choline-chloride 200 mg, zinc 72 mg, iron 40 mg, manganese 54 mg, copper 10 mg, iodine 1,8 mg, selenium 0,21 mg.